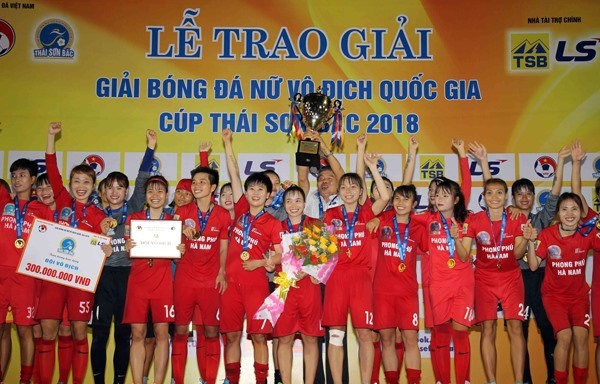 HÀ NỘI — Phong Phú Hà Nam beat defending champions HCM City 1 1-0 in the final match of the National Women’s Football Championship to take the trophy for the first time on Monday. The game was held at Thống Nhất Stadium in HCM City. The two sides played very carefully after the referee Lê Vũ Linh blew her whistle. Hà Nam’s best players were strong in this game, while the hosts were missing their four key players as they were suspended by the Việt Nam Football Federation for their violations in their semi-final game with Việt Nam Coal and Mineral. The visiting side created several dangerous situations for HCM City 1’s goalie Kiều Trinh in the first minutes. However, the hosts fought back strongly but they couldn’t break the visitors’ defence line. In the 39th minute, Hà Nam enjoyed a corner kick in the left wing and Thanh Hương headed to make the opener for Hà Nam. After the break, Hà Nam missed their chance to double the score as Nguyễn Thị Nguyệt’s shot hit the cross bar. After that, the hosts had two chances to equalise the score but Kim Loan and Tuyết Ngân couldn’t beat Hà Nam’s goal keeper Trần Thị Hải Yến. Determined to level the score, the hosts played counter attack continuously but they failed to defend the title they had won at the same event last year. Hà Nội and Việt Nam Coal and Mineral shared third place at this year’s football season.